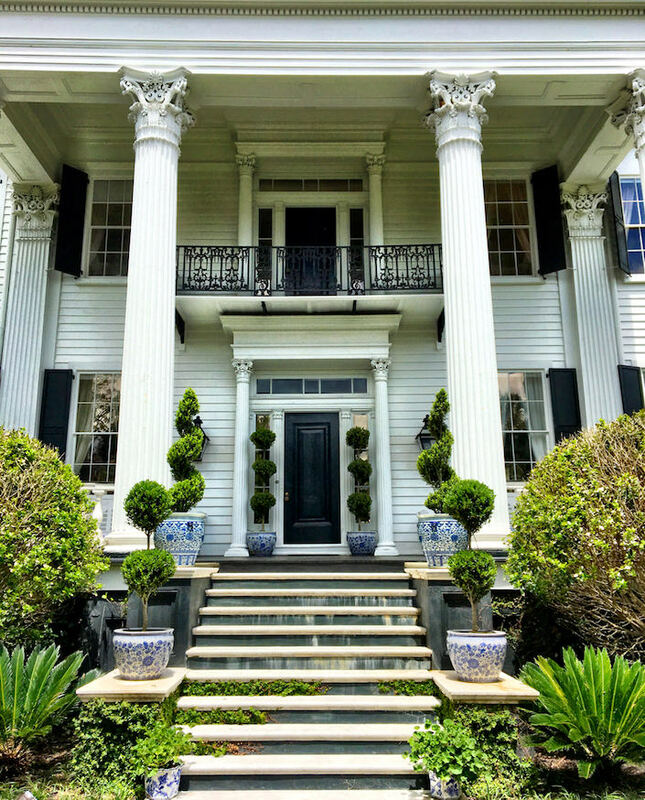 When Susanna and I decided to launch our new Setting the Table With video series, filming Carolyne Roehm in Charleston at her historic home was at the top of our list. Among her endless list of accomplishments, her talent and passion for entertaining and setting a beautiful table is legendary. From flowers to flatware, no matter the season nor locale, her tablescapes have filled books, inspiration folders and Pinterest boards the world over. Please tag along behind the scenes as Carolyne shares her tips and advice for setting a stylish table. On our recent visit to Charleston, Susanna and I were lucky enough to be welcomed into Carolyne’s new home (look for a full video visit this fall) where, when not at her beloved Weatherstone in Connecticut, she is now spending much of her time. 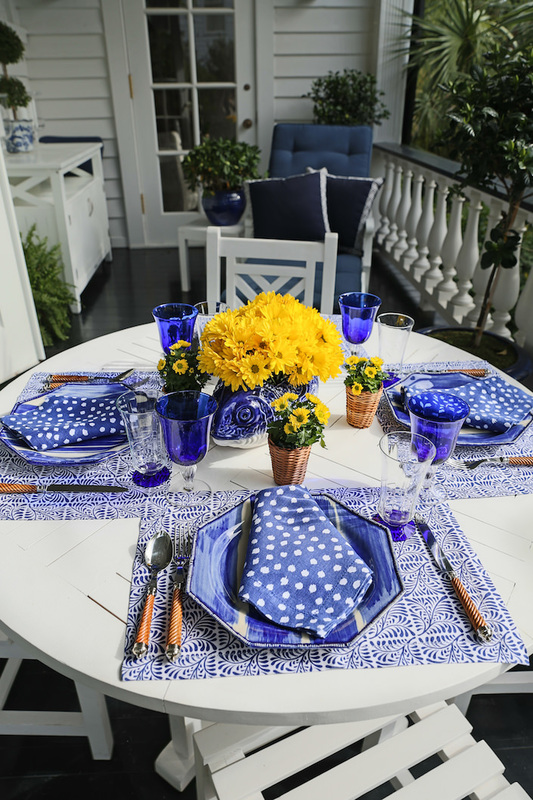 Even though she was busy preparing for a dinner party that evening, Carolyne was kind enough to steal a few moments to share how she sets the table for a casual porch dinner. No detail is every too unimportant and yet what inspires us about Carolyne is her inventiveness, resourcefulness and creativity. While Carolyne studied with the most famous of Parisian floral designers, in Charleston her favorite new Charleston flower source is Trader Joe’s! So thank you Carolyne – we always find ourselves learning something new from you. We can’t wait to share how you’ve transformed your amazing Charleston home! This entry posted in design, entertainment, interior design, Quintessence video series, Setting the Table, Stylish Shopping, travel. Entry Tags: Carolyne Roehm, Charleston, Entertaining, how to set the table, setting the table, table setting, tablescape, Tabletop Bookmark the permalink. That’s a very pretty table, but above all the setting is absolutely swoon-worthy. So lush. 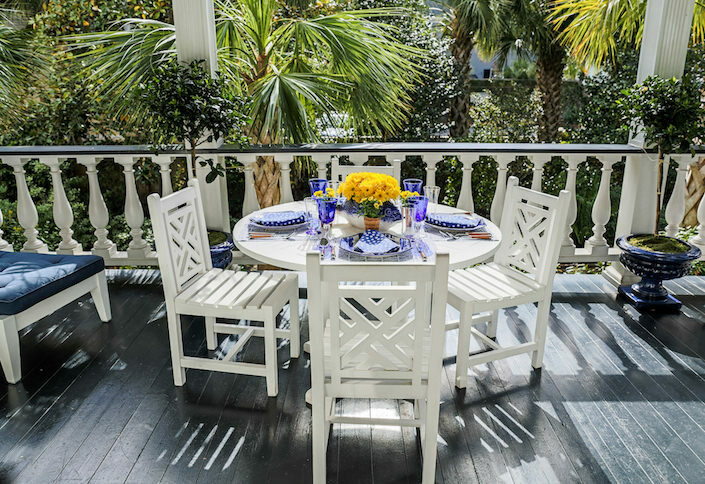 Oh this video is so beautiful of Carolyne’s Beautiful Charleston home and porch. Carolyne is so darling and her home is absolutely stunning. The peek inside her cabinets and napkin drawers is so much fun. Thank you for the napkin folding tutorial, even I can do that! Just last week I took her books off the shelf and was, once again, marveling at the breathtaking details. It’s almost impossible to believe someone “actually lives” like the pictures. Your beautiful video stories bring it all to life. And a special thank you for countenancing my use of cocktail napkins. As I commented after your last CR video, she is indeed a force of nature. Perfect decorations! Everything looks amazing! The napkins are so nice! Following the tutorial! LOL! They have the best flowers for sure! And amazing orchids! Congratulations Stacey and Susanna: I love Caroline Roehm!!!!! Loved this!! Paused so many times. Can’t wait for fall but this was a great appetizer!!!!!!! I have purchased every book Carolyn Roehm has written. I’m so glad that she is so cool too. Thanks for the sneak peak into your stylish life! I had the pleasure of working as a design assistant for Caroline when she had her clothing collection. She has the most amazing eye for detail and a true passion for everything she touches as evident in her homes. Lovely video, thank you. Wonderful video, that setting is fabulous yet she makes it look so easy! 87 queries in 1.474 seconds.